Justin, LIve 24/7 - Where is Justin Now? The most popular post on TETLife of all time is Watch Justin, live 24/7 (April 14, 2007) with almost double the number of page views (16174 views) of the second most popular post getpaidtodraw.com - Your Questions Answered (Note: getpaidtodraw.com no longer exists if I just piqued your interest). Both posts are from 2007 (FYI this site dates back to 2004) but no other post has come close to my article reporting on the establishment of Justin.TV, which would go on to evolve and merge into one of the biggest live game streaming networks, Twitch. Justin.TV, in its original form, was a single live stream of co-founder, Justin Kan's daily life as he set up a technology site that would make it easy for anyone to live stream. 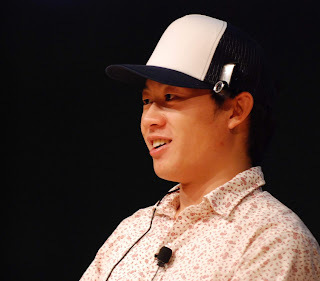 Kan wore a webcam on his hat everywhere he went and popularized the term 'lifecasting' as he broadcast his daily life. At the time I wasn't all that impressed with the idea, stating that most people's actual daily life isn't something you'd want to watch 24/7. So I wasn't surprised to read (in researching this article) that Justin's life was made a little more interesting with staged activities mixed into the daily grind. Justin managed to broadcast his life 24/7 for eight months before realizing his goal of establishing a live streaming service that initially adopted the name Justin.TV. For a time it was one of the largest video platforms in the world with more than 30 million unique users every month. Live game streaming really took off on Justin.TV. So much so that in 2011 that section of the site was spun off into a new service called Twitch.TV. As Twitch grew Justin.TV would eventually wind down until, in August of 2014, it was shut down for good. Now if you try to access Justin.TV you are simply redirected to Twitch. Justin Kan, went on to found and sell several successful startup companies, and has continued the life of a serial entrepreneur. His official website is a great place to keep up with him, though thankfully not 24/7. At the end of the day Justin brought people's attention to the concept of live streaming and turned that into an internet success story probably beyond what even he initially imagined.